we hurried home, ate lunch, and headed out to go hike around a local state park for a few hours. it was lovely. when we came home, we spent time relaxing on the back porch and leisurely eating dinner. it was a nice surprise since we are usually eating super fast because we have to run somewhere. after dinner, ryan had to go to a meeting. in no time, he was home again because his meeting was canceled, but he brought me home an iced coffee since he was out. (such a sweet husband, that one!) it was another really nice surprise. since ryan's meeting was cancelled, we had time to spend together in the kitchen making dessert. 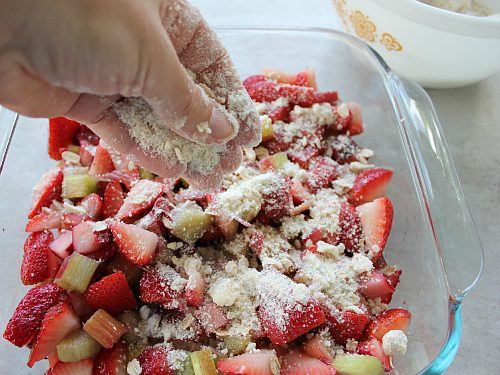 we had fresh strawberries and fresh rhubarb in our refrigerator just begging to be used. 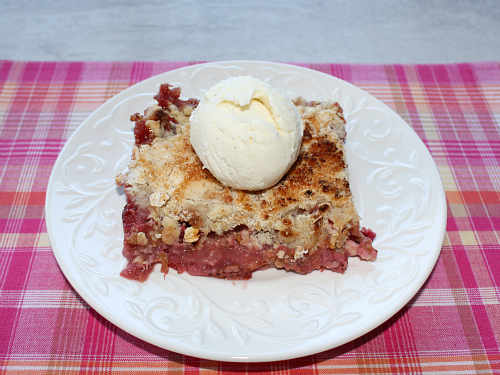 there's just something about the warm weather of the summer that calls for strawberry rhubarb desserts. 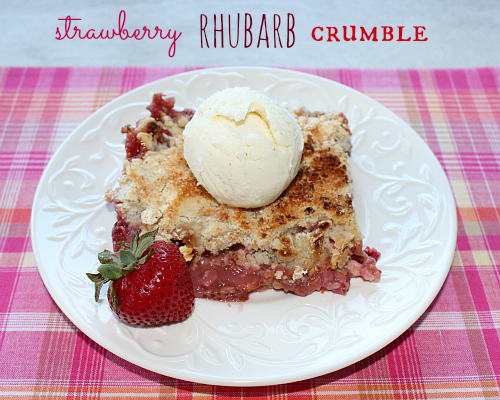 without a doubt, strawberry rhubarb pie is a classic, but it's nice to change things up a bit every once in a while. 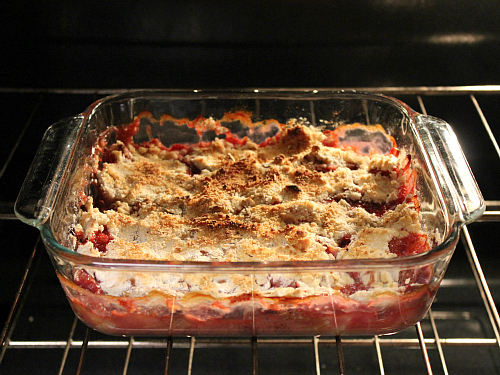 so, we made strawberry rhubarb crumble instead. this recipe is super simple and can be thrown together in no time. you don't need any fancy kitchen equipment, just a few simple tools and a few spare minutes. this crumble smells amazing as it bakes. it's like an awesome little bonus that your house will smell wonderful when you bake this dessert. who needs strawberry-rhubarb scented air fresheners or candles? not us! 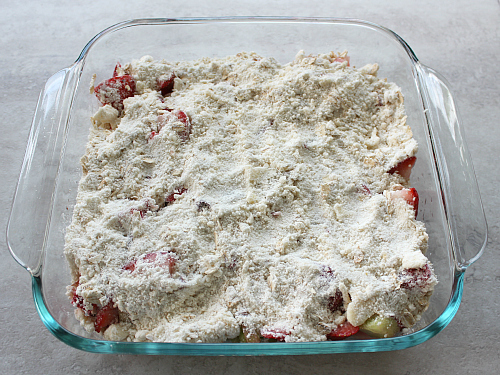 we ate our strawberry rhubarb crumble with a scoop of some really awesome vanilla bean ice cream, while sitting in bed with the windows open and catching up on shows on our dvr. it was the perfect way to welcome summer. this dessert was such a nice surprise. it was really easy to make and super delicious. thank goodness for little surprises in life! 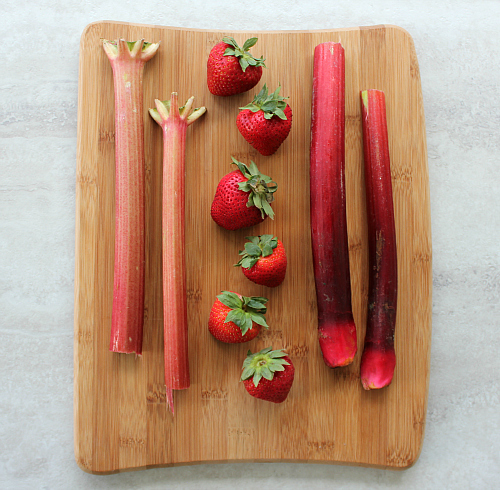 preheat your oven to 375 degrees F. combine the rhubarb, strawberries, and agave nectar in a bowl and toss well to combine. in a separate bowl, combine the flour, sugar, and butter. use a pastry cutter (or a fork) to incorporate the butter into the dry ingredients. mix in the oats. 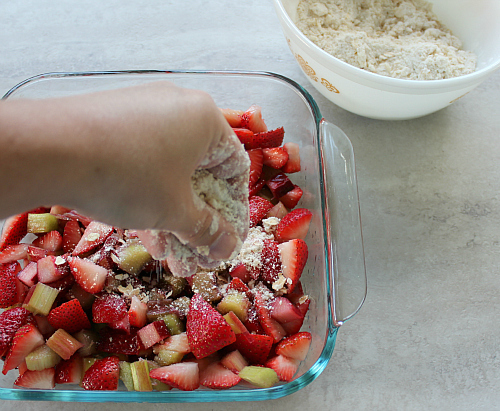 pour the fruit into a 8x8 inch square glass baking dish, and distribute the topping evenly over the fruit. bake for 45 minutes until the fruit is bubbling and the top is golden brown. let cool for 10-15 minutes before serving. serve with vanilla ice cream. Ummmm ok stop! Crumbles are my weakness! This looks delish. Dad would like that for father's day. 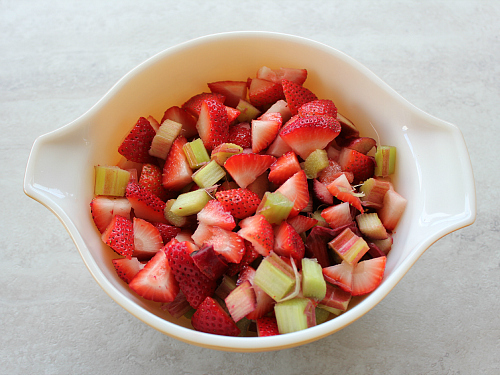 I love rhubarb and strawberries.